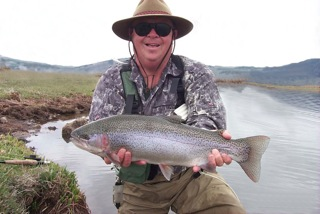 Bob Bush has been a member of Boulder Flycasters since the late 1960’s and has been a board member on and off for 30 years. I started fly fishing in 1956 and began tying flies soon after. My flies and bio are included in Todd Hosman’s book, “Colorado Trout Flies” featuring more than 30 of Colorado’s best fly tiers. I have been fortunate to be recognized by Colorado Trout Unlimited, garnering the coveted Silver Trout Award for my outstanding work volunteering my time for a number of design pieces including numerous CTU Annual Reports, Century Club promotions, Fund Raising mailers, and State Stream Clean-Up T-Shirt designs. I annually contribute hundreds of hours helping BFC and CTU in many ways including the full color signs that decorate the Roger’s Park conservation project, nine miles up Boulder Canyon along Upper Boulder Creek. I was the lead designer for both the Boulder Creek Watershed Map & Angling Guide and the St. Vrain Watershed Map & Angling Guide which has created a steady income stream for the Chapter. Currently I am designing, with help from the BFC mapping committee, the latest endeavor for the club: “The Big Thompson Watershed Map & Angling Guide” that will be available for sale this summer. Finally, I have been recognized as the Boulder Flycaster of the year at least 10 times and co-chaired of the 2007 & 2008 National Flyfishing Championships held near Boulder where the U.S. National Flyfishing Team was chosen.